These Flourless Chocolate Cookies will leave people questioning whether or not they are truly flourless. You can’t even tell they lack flour thanks to their deliciously chewy texture, soft centers and slightly crisp edges. 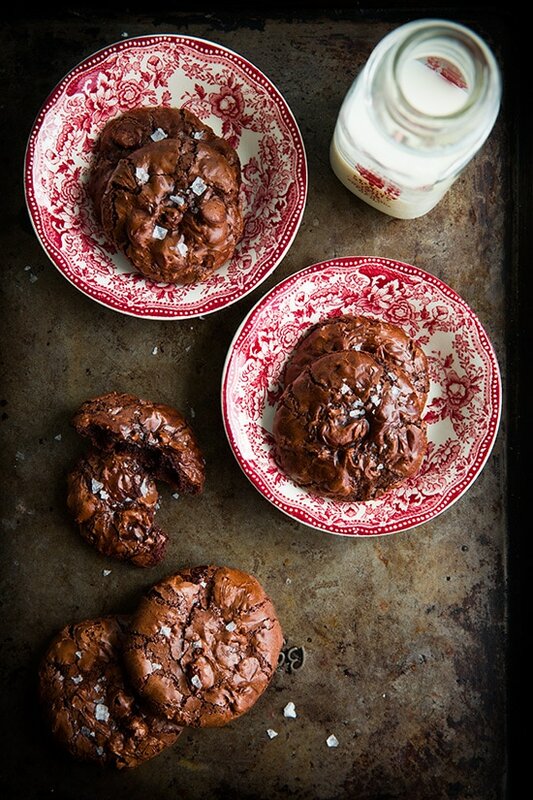 The ultimate chocolate cookies! These flourless cookies are everything you look for in a cookie. 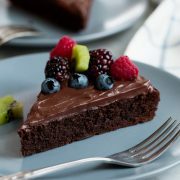 Their chocolatey decadence really shines through because there is no flour to tone down that rich flavor. These are much like an over-the-top brownie, but in cookie form. You won’t believe that a cookie this good was so easy to make. 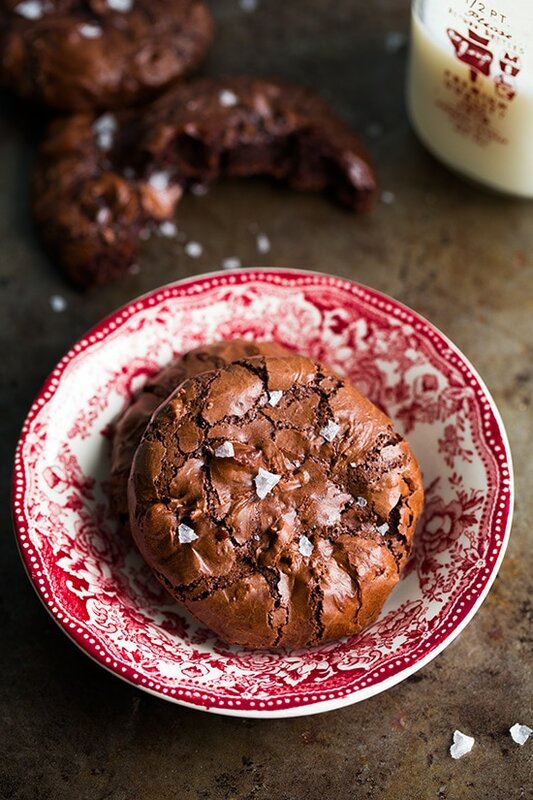 One bowl, a short list of basic pantry staples (yes Maldon salt is a pantry staple) and less than 10 minutes prep and you’ve got flourless chocolate cookies baking in the oven. I love these slightly warm, as well. Too warm and they’ll fall apart, but if you reach that key cooling point these just melt away in your mouth. Whisk together powdered sugar, cocoa powder, cornstarch and salt until well blended. Drop dough onto prepared baking sheets. Bake until cookies are puffed and crackled, about 14 minutes. Remove from oven and sprinkle tops lightly with Maldon sea salt, if desired. Allow to cool on baking sheet 5 – 10 minutes, then cool on a wire rack. No, you can use whatever chocolate chips you have on hand. 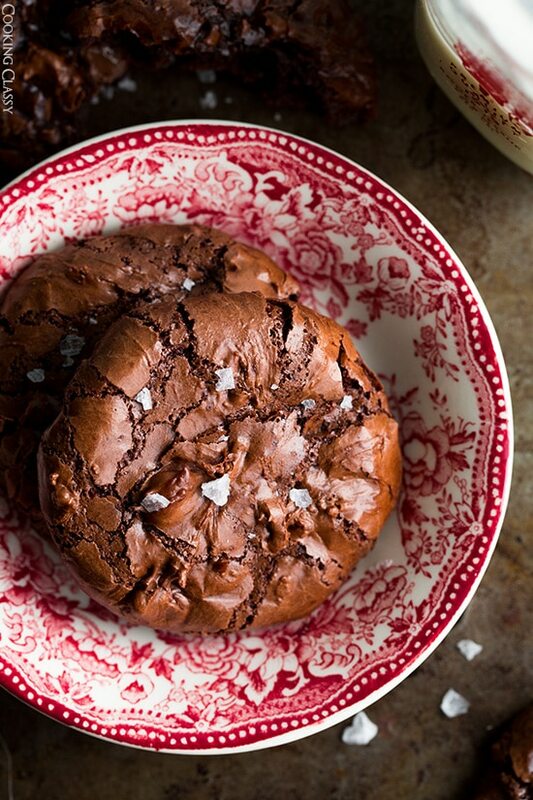 These chocolate cookies are extremely rich no matter what kind of chocolate you mix in. Can I Sprinkle Regular Salt on Top if I Don’t Have Maldon? Personally, I wouldn’t try that. Table salt is much finer and saltier than Maldon and would make these cookies too salty. 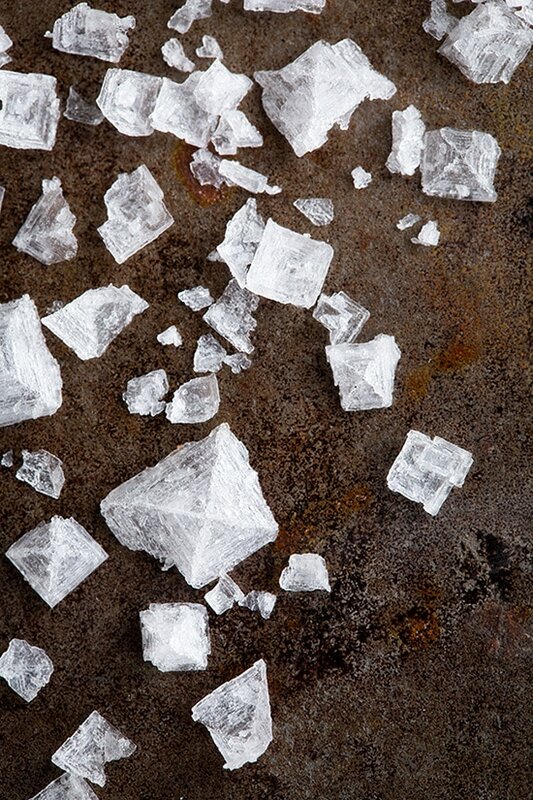 Kosher salt might work instead of Maldon, but without testing I can’t know for sure. 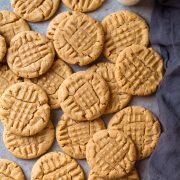 Keep these flourless cookies in an airtight container at room temperature. They should stay fresh for 2 to 3 days if stored this way. If making these chocolate cookies gluten-free, be sure the powdered sugar and chocolate chips you’re using are certified gluten-free. Let these cookies cool slightly before enjoying them. If you try to eat them straight out of the oven, they’ll fall apart in your hands. If you don’t have chocolate chips, feel free to use finely chopped chocolate from a bar. These Flourless Chocolate Cookies will leave people questioning whether or not they are truly flourless. You can't even tell they lack flour thanks to their deliciously chewy texture, soft centers and slightly crisp edges. The ultimate chocolate cookies! In a large mixing bowl, whisk together powdered sugar, cocoa powder, cornstarch and salt until well blended. Add in egg whites, egg and vanilla extract and mix until well combined. Fold in chocolate chips. 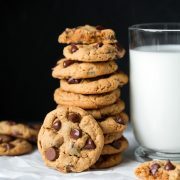 Drop dough by the heaping tablespoonfuls onto prepared baking sheets, spacing cookies 2-inches apart. Bake in preheated oven until cookies are puffed and crackled, about 14 minutes, rotating sheets to opposite rack once during baking. Remove from oven and sprinkle tops lightly with Maldon sea salt if desired. Allow to cool on baking sheet 5 - 10 minutes, then cool on a wire rack. If making these gluten-free, be sure the powdered sugar and chocolate chips are certified gluten-free. Store these cookies an airtight container at room temperature. Derek: don’t bother making these. followed the recipe EXACTLY. EXACTLY. batter turned out like brownie mix. which of course led to completely flat cookies that looked like chocolate pancakes. garbage. these were for a cookie party, and it was a complete waste of 15 cups of powdered sugar and 15 eggs.